I finally got around to uploading a new LinkedIn profile background image. Why? LinkedIn had changed the image ratio and suggested size since I’d uploaded my previous image. As a result, the old image looked bad and made no sense. Here’s how the old and new BG images compare. You can see a larger version of the compare here. I constructed the new BG image using three of my illustrations. The two on the ends highlight Chick-fil-A and Coca-Cola, my two biggest clients. 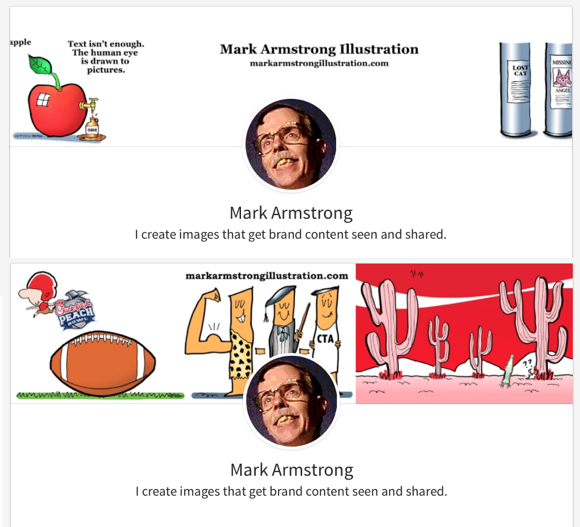 The middle illo was for a post called The 4-1-1 Strategy For Cultivating A Social Media Influencer. The muscle-pump makes for a nice play on “Arm-strong,” and I added my website URL right above it to help telegraph the gag. The current recommended size for a LinkedIn background image is 1584 x 396 pixels. To add or change a BG image on your LinkedIn profile, go here, click on the appropriate dropdown menu, and follow the steps. Hi Mark… just checked mine, still fits! Thanks for the post.